Ok, ok, so there aren’t any rumors of my demise (that I know of) but I obviously haven’t posted here in more than two months. So, the 3 of you who read this thing might have been worried that I’d met my demise….or not. In the last two months, I’ve been busy with getting settled in to life in Frankfurt, learning the ropes of the consulate and my job, and a couple of quick trips. Frankfurt’s a great place to live and settling in has gone fairly smoothly. My HHE, UAB, and car and all arrived without any apparent damage. I say apparent, because I still haven’t fully unpacked my HHE, even though I’ve had it for more than a month now. But, I’m making progress. That counts for something, right? 😉 I’m through most of the hoops and paperwork for things like my diplomatic ID, car registration, internet set up, etc. There are couple of things I’m still waiting on, but most of the paperwork has at least been submitted. Work has been busy. Even though the consulate here in Frankfurt has more than 1,000 people working in it, I’m working in combined Pol/Econ section that’s much smaller than any section I’ve worked in before. That has a number of advantages, in that I’m getting experience in a lot of new areas, but also means that the pace of work is generally a bit more hectic and I’m also having to learn a lot of new things. But, all in all, it’s going pretty well. My boss and coworkers are great, which can obviously make or break a tour. I’ve managed to squeeze in a couple of trips, so far too. I’ve gone to Stuttgart for work, to Mainz and Wiesbaden with my aunt who was in town for work, to Belgium to visit one of my host families from when I was an exchange student, and I just got back from spending Labor Day weekend in Paris visiting a friend from Ottawa. Hope all is well in the blogosphere! Greetings! For once, when I talk about catching up, I’m not just talking about catching up on blogging. After feeling like I’ve been living under a rock between homework for the Econ Course and playing catch up on missed classes for awhile, I’ve managed to catch up with several FS and grad school friends in the last few weeks now that I have a bit more free time. I’ve been catching up with FS friends who are moving back to town and grad school friends in the area whom I’ve neglected to reach out to in a long time. It’s been really good to hear what’s new with them and to see people whom I’ve missed. Other than that, I haven’t been up to anything much exciting, with one exception. Last weekend, I saw on Twitter that Colonel Chris Hadfield was signing copies of his books at the Smithsonian Air and Space Museum on the National Mall. I was covering space issues in Canada while he was on the International Space Station, and it was amazing the buzz he created and how well he connected with people through various forms of social media. So, it was exciting to hear that he was in town and I wanted to get his new book anyway, so I went down to the Air and Space Museum to get the book. One of the fun things about living in the DC area. What!?! TWO updates in one month? What kind of craziness is this? Well, don’t get too excited, this update will be a short one. After months of living in the Washington, DC area, I finally got out and did some sightseeing. I’ve been in a rut of going to FSI for class, doing homework, doing errands, etc., and haven’t really taken advantage of many of the very cool things to see and do in the DC area. 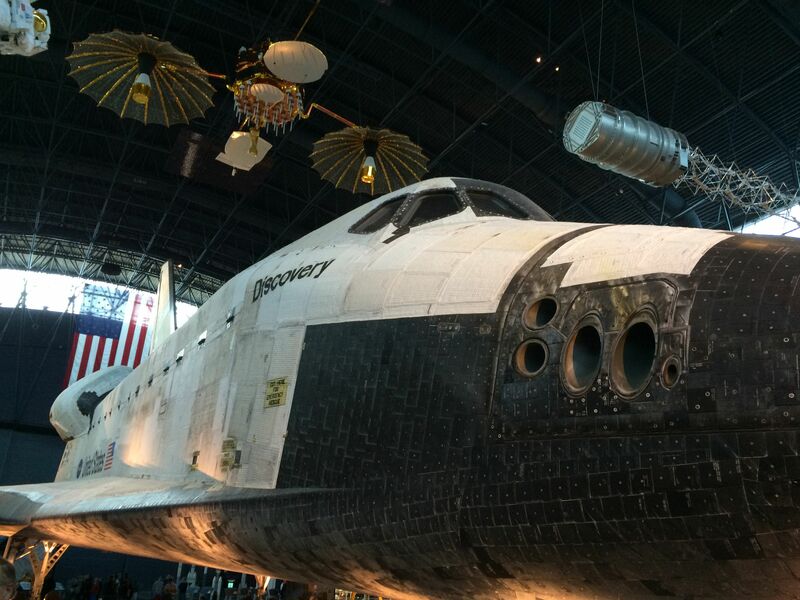 So, yesterday, I made the trek to the Smithsonian Udvar-Hazy Air and Space Museum out by Dulles airport. 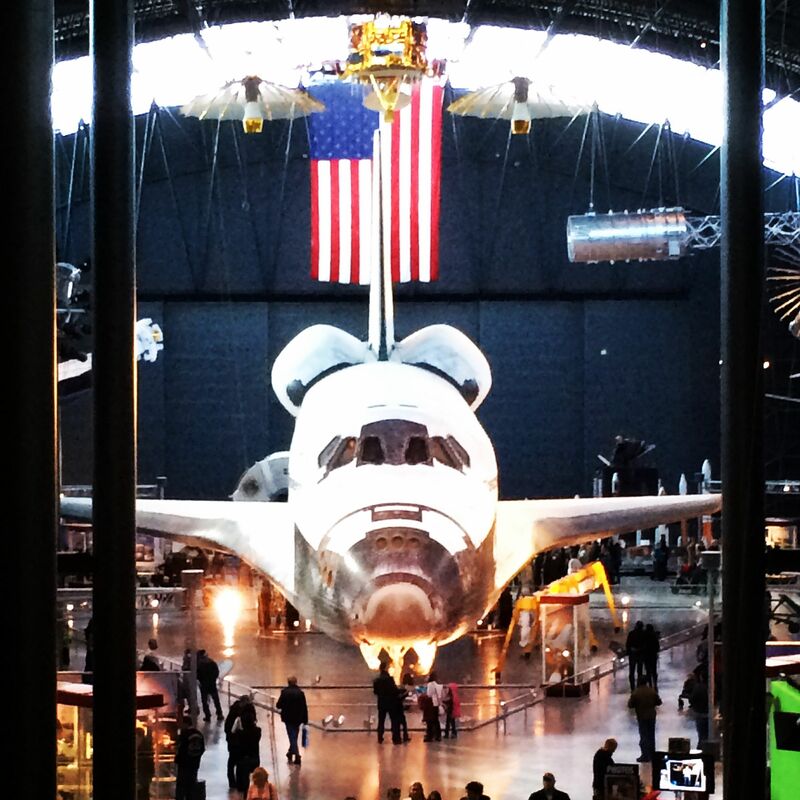 Most visitors to the DC area are much more familiar with the Smithsonian Air and Space Museum on the National Mall, but the Udvar-Hazy Air and Space Museum is quite impressive, too. It’s a huge hangar and has hundreds of full-sized airplanes, from historical pieces like the Enola Gay, which dropped the first atomic bomb on Hiroshima, to more recent ones like the Red Bull Stratos that Felix Baumgartner jumped out of in 2012. 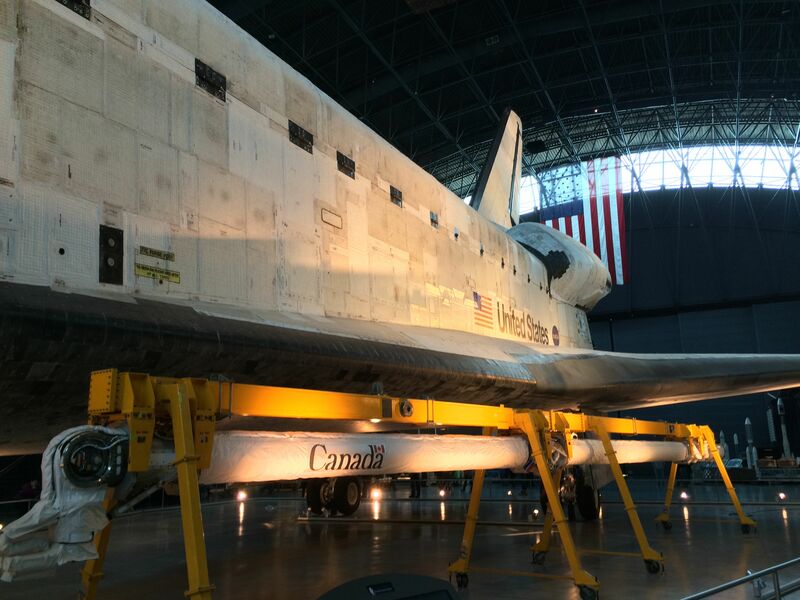 And, it’s home to Space Shuttle Discovery! I will admit that Discovery is the primary reason that I went. I’m a sucker for space shuttles. And, this one even had its Canadarm displayed next to it, which ties things back to my assignment in Ottawa where I covered space issues and visited the Canadian Space Agency HQ and saw where they train astronauts on how to use the Canadarm. It’s been awhile since I last posted. I fully expected to blog about my home leave adventures, but when I would sit down to write about it, I found I just didn’t want to write it up. I think that, honestly, I didn’t want to admit that it was temporary and would be over soon. It was just so great to be HOME. Yes, HOME in all capital letters. The Washington, DC area is great in many ways and I was definitely looking forward to the Econ Course and to Frankfurt, but neither DC nor Frankfurt is HOME, no matter how wonderful they may be and no matter how settled I may eventually get in my time in either place. So, I just didn’t want to jinx it or admit that it was a temporary thing. But, Home Leave was in fact temporary (shocking that the State Department won’t let me stay on vacation indefinitely and keep paying me, I know. 😛 ) and I’ve now made it back up to the DC area. So, picking up where I left off almost two months ago, here we go. The Diplocat and I continued on our road trip homeward and stopped in Oklahoma City, Oklahoma to visit some family there. I got to see family and friends there, and also stayed in my Grandmother’s old house, which will likely be sold by the next time I go back to Oklahoma City. My grandmother passed away just a few weeks before I started A-100 in 2009, so it seemed fitting to spend some time there in between assignments. It was also good to catch up with family that I hadn’t seen while I was in Canada. After a few days there, the Diplocat and I continued on home to Texas. Again, it was good to be HOME. It was good to be able to spend a solid chunk of time at home, to reconnect with friends and my parents, to attend church at my home church, to eat a lot of yummy foods that I’d missed like Tex-Mex, Mexican, BBQ, Blue Bell ice cream, Big Red soda, etc. It was nice to shop in familiar stores that I’d missed. It was nice to not need the GPS because I knew where I was going, etc. In short, it was just good to be HOME. Some of the more interesting things I did were speaking about the State Department and the Foreign Service at Rotary Clubs and to incoming students at my grad program. Also, on the way back to DC, I stopped in Houston to visit some friends from when I spent a semester interning there. The drive back up to DC went well, aside from the Diplocat’s incessant meowing. She’s lucky she’s cute and cuddly, or else she miiiiight have been thrown out of the car. Meowever, we both made it to DC and she seems to have forgiven me for putting her through all of the driving. I shudder to think what flying to Frankfurt with her will be like, but at least it’s only one flight and only one day, and maybe the plane noise will drown out her yowling or freak her out enough that she stays quiet. A girl can dream, right? I’m now a week in to the Econ Course and so far it’s gone well. The first week was mostly administrative things (timekeeping, laptop security, and travel vouchers, oh my!) and math that we’ll need when we get in to more of the econ topics. My classmates have a variety of experiences, and I think it’ll be good to learn with and from them. The schedule is also nice. I’m in class from 9-4 most days, with homework each night. It’s nice to have a little more flexible schedule, where I can do my homework right away after class, or go run an errand that needs to be done during business hours and then do my homework later in the evening. It’s also nice to be back at FSI and see friends that I haven’t seen in a long time. I’ve reconnected with grad school friends in the DC area and FS friends, too. It’s sometimes hard to get things done at FSI because you keep bumping in to friends you haven’t seen in awhile and chatting with them about what they’ve been up to since last you saw them, instead of getting whatever task you set out to do done. I’ve bumped in to Juarez friends who’ve gotten married and had kids since I last saw them! People who had newborns in A-100 five years ago now have kindergarteners. Craziness, I tell you! So, it’s good to catch up with folks and see what’s new and exciting with them. And, while the DC area may not be HOME, it’s still a nice place to spend a few months. I’m looking forward to doing some sightseeing and enjoying some of the neat events that happen here. I have officially reached the “burn all the belongings and start over again” phase of packout preparation. The hassle of organizing all my stuff, the prospect of unpacking and reorganizing all of it in Washington, and the worry about something getting damaged or going missing en route has reached a point where I just want to burn it or toss it all out and start over. Of course, I won’t do that. It’d be too expensive for one thing. And, it’d be hard to burn the stuff without setting the whole apartment on fire. Still. I’m ready for this whole move thing to be done. I’m a little bummed that I’ll probably miss out on the fun Canada Day festivities since I’ll be busy with packing prep, but so it goes. Other than that, things are going well. I’ve gotten a bunch of giant ziploc bags and ziploc totes and they’re making the organization part of packing a bit easier. Hopefully, they’ll both protect my stuff from dust and moisture, and also keep the things I want to stay together, together. So, for example, the fitted sheet doesn’t end up in one box and the flat sheet and pillow cases in another. We shall see. And, there are plenty of things at work to sort out, too. Lots of loose ends to tie up and lots of administrative hoops to jump through before I can make it out of here. And preparations for the 4th of July party. But, it’s moving along. Hola! Sorry for the lack of updates. It’s been busy! First, the parental units came for a visit. They were here for about a week and we got to do a lot of sightseeing. We went to Parliament Hill, Rideau Hall, The War Museum, The Aviation and Space Museum, the RCMP Musical Ride Training Centre, the Diefenbunker, and of course I took them in to see the embassy! Then I was back in the office for a day before going to Montreal to help with some visitors at the Conference of Montreal. It was a great visit and a great event, and I even got to catch up with J, a friend from Ciudad Juarez, who’s now posted in Montreal. Now, I’ve been back in the office for about a week, trying to wrap up loose ends, get things ready for my successor, organize things for my move, etc. Oh yeah, and new things keep popping up! So, it’s been a busy few weeks. However, things keep moving along. My packout is scheduled. I’m where I should be with the checkout list. I’ve made arrangements for most of the things I need to do with my apartment since this is an LQA post, like scheduling my electric and internet account for cancellation when I move out, etc. And, yesterday, I officially got paneled for the job in Frankfurt. It’s a long story, but a series of hiccups pushed the paneling this long, but all’s well that ends well. 🙂 I’ve also made hotel reservations for my trip down to Texas for home leave. So, that’s the news here. Next up, packout, Canada Day, and the 4th of July!